Safely arrived in Barcelona for EGEE'09 and able to verify that Hotel Barcelo Sants ("your hotel in the sky") is very pleasant. 2. Park Guell was a failed property development venture - Gaudi was one of the few people to actually live there. 3. 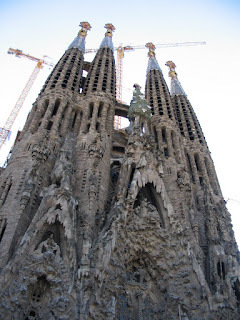 The Sagrada Familia is a seriously impressive building. I will be busy setting up the EGEE'09 booth tomorrow. Don't forget to drop by and say hello to the EGEE dissemination team during the week. Fill out our communications survey for a free exclusive EGEE hat and enter the prize draw for a specially designed poster for your project, courtesy of GridTalk.